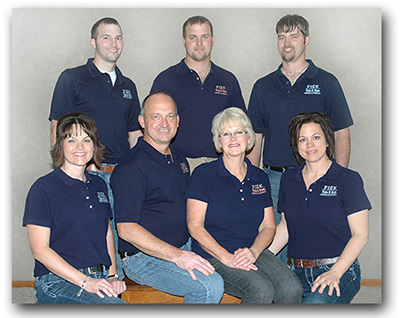 “For great service, selection and price shop Fisk Farm & Home” is the motto that Curt and Julie Fisk have lived by since 1977 when they purchased their family-owned and operated business from Evans Hardware. Today along with their five children, they operate two successful retail locations that meet the needs of the farm and town communities. The downtown Monona store moved out to the Highway 18 location in 2006 where daughter, Laura Whittle, and son, Peter Fisk, work. The Cresco store, added in 1996, is where you will find daughter, Janelle Regan, along with sons, Phil Fisk and Paul Fisk. Also in the family operation is Curt’s brother, Tim, along with his wife, Diane. Curt and Julie are very proud that the children have remained in the family business to continue what they began 38 years ago. Not only are Curt and Julie proud of their children but also of their 14 grandchildren. They, too, want to be a part of the action by volunteering for special events at the store such as serving milk shakes during June dairy month. Fisk Farm & Home has contributed to the economic development of the communities they serve. Not only do they purchase local services and support community causes but they also employ 30 people to help run the stores. “We are very lucky to have a good group of employees to make both stores run smoothly and to provide the service that the customers have grown to expect,” boasts Julie. The Fisk family and their employees work especially hard at being receptive to their customers’ needs. Both stores serve their respective towns but customers come from all over the area because of the stores’ reputation of carrying a wide variety of products and excellent service. Customers can choose from an expansive inventory that includes hardware, tools, paint, electrical, plumbing, automotive, farm supplies, animal health, pet supplies, lawn and garden items, housewares, clothing, toys and much more. Services in both locations include key cutting, custom-made hydraulic hoses, cut and thread pipe, purchase and exchange propane tanks and digital photo processing. The Monona location also offers a rental department, glass and screen repair, hunting and fishing licenses, UPS shipping and a live bait station. In January 2015, Fisk Farm & Home launched an online store to provide service to customers who enjoy shopping from the comfort of their homes. Fisk’s have been around long enough to see the generations change but what hasn’t changed is that the families still shop at Fisk Farm & Home. They appreciate the customer loyalty and will continue with “Great Service, Selection and Price” in both the Monona and Cresco stores and now, their store online.